Alexander Graham Ptuiac, the son of an inventor, dreams of playing football. But his dreams are thwarted by his lack of athleticism and overall lanky build. Like any kid with a dream, Alex tries out anyway, just in case. If nothing else, maybe he can win the role of water boy. 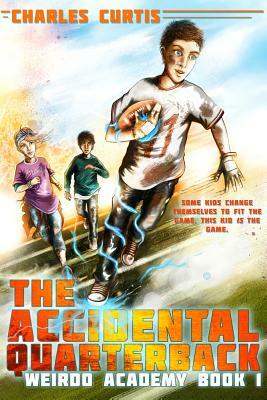 So when Alex suddenly manifests superhuman powers during football tryouts, Alex can't believe his good luck. But his new abilities can get him kicked off the team; unless Alex can keep it a secret long enough to find out how the heck he got this way. Enter Dex, a diminutive classmate who can somehow jump as high as ten feet in the air. Now, Alex isn't the only one at school with a secret. Except, the boys have caught the attention of some pretty nefarious adults, intent on making sure neither Alex nor Dex make it through the season. When truth is stranger than fiction and adults are out to get you, there's only one thing to do. Play ball! Charles Curtis is a sports buzz reporter for NJ.com who has made radio appearances on 92.9 The Ticket in Bangor, Maine, WLIE 540 AM in Long Island, and on morning shows across Canada via the CBC. He has written for publications including Bleacher Report, Entertainment Weekly, ESPN The Magazine, and TV Guide. He lives in New York City.